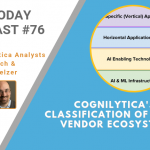 Cognilytica tracks almost 3000 companies that offer AI-specific or AI-enhanced products for sale in the market. However, as you can imagine, there’s a great amount of diversity in these vendors. Some vendors focus on providing low-level “enabling” infrastructure that supports any range of AI, machine learning, or other compute- or data-intensive activity. Others provide a single-industry application that applies AI to a particular, specific business or industry problem.